This month marks the publication of my article “The Datalogical Drug Mule” in the Data issue of Feminist Media Histories. This article had a varied lifetime, first as a final paper for a media theory class, then as an award-winning conference paper for the International Communication Association, and finally as a journal publication. In short, the article argues that borders have always functioned algorithmically, a feature that has only intensified with the spread of information and communication technologies. Yet, despite this technological sophistication, the functioning of borders still relies heavily on human physical interaction. The article traces these issues by staging a fictional travelogue of a drug mule based on official documents and anecdotal evidence. I’ve recently taken to Prezi less as a presentation software and more as a space for creating visualizations -concept maps, timelines, etc – that help me work through my readings and research material. This particular visualization is inspired from a seminar presentation I prepared on Brian Larkin’s Signal and Noise: Media, Infrastructure, and Urban Life in Nigeria, a book I have encountered multiple times in the course of my grad career so far, and whose themes and methodologies speak to my own research interests quite a lot. The visualization in full Prezi mode can be accessed here. 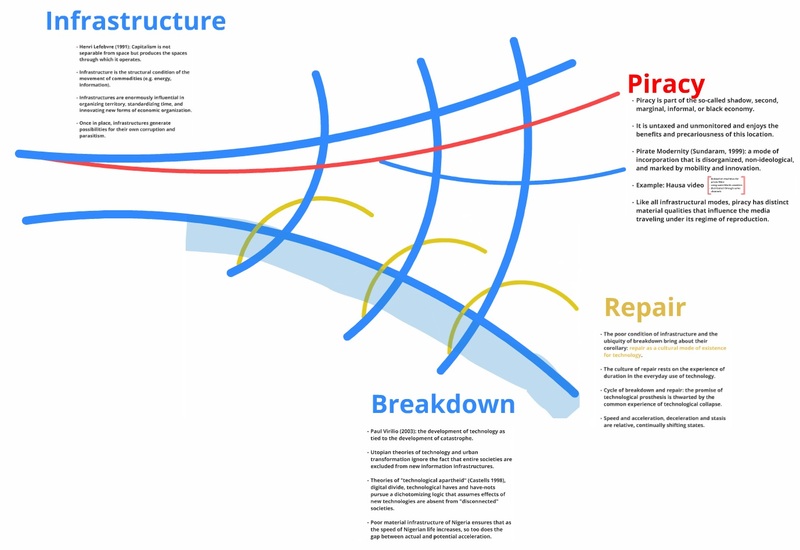 I hope to keep developing this visualization, and adding concepts and theorists that speak to the same interconnectedness of infrastructure, piracy, and breakdown/repair. Comments and suggestions are most welcome.